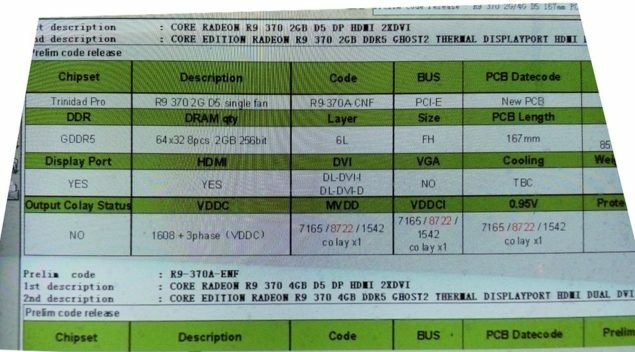 A few months ago, we talked about the Trinidad GPU which was meant to replace the Curacao based Radeon R9 270 series cards. Videocardz has managed to get a listing of the upcoming Trinidad Pro graphics chip that will be featured inside the upcoming Radeon R9 370 graphics card in early April 2015 featuring an improved GCN architecture focused on raw performance and power efficiency. The Trinidad GPU will land in two variants, a Pro model that would be featured inside the Radeon R9 370 and an XT model that would be featured inside the Radeon R9 370X. The specifications for the specific XFX model derived from the leaked sheet indicate that the XFX Radeon R9 370 Core Edition (R9-370A-CBF) is going to feature 2 GB and 4 GB GDDR5 memory (in future) running across a 256-bit interface. The card will feature a single 6-Pin connector since the TDP is around 110-130W down from 150-180W on the Curacao (Pitcairn) based Radeon R9 270 and 270X models. The card will feature Dual-DVI, HDMI and a single display port. The core edition naming implies that the card will feature a factory overclock. The card measures in at 167mm, has a single cooling fan on the shroud and is positioned in the performance tier. 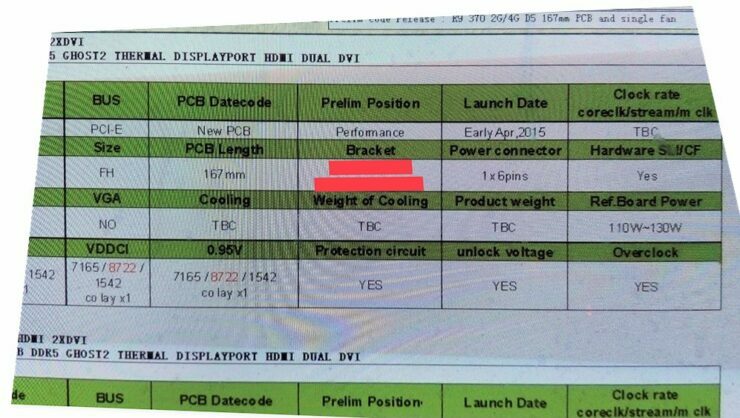 The clock speeds for the card are yet to be confirmed. AMD needs new chips at hand and Trinidad along with the upcoming series is the answer. We will wait for more information on the Trinidad since it does sound like an interesting chip to tackle NVIDIA’s GeForce GTX 960. On the other hand, AMD is also going to out their massive 300W HBM enabled chip, codenamed “King of the hills” based on a 28nm process in a last fight with NVIDIA’s own 28nm based GM200 Titan X graphics card which was revealed just a few days ago. These last 28nm chips of this longest running process generation will be competing in 2015. The launch timeframe of the card in April 2015 might be an indication that AMD will be showing off their cards very soon.